Google Offers More Mobile Services | BlackBerry Blast! Google has added yet another service to their mobile offerings, Google Local. 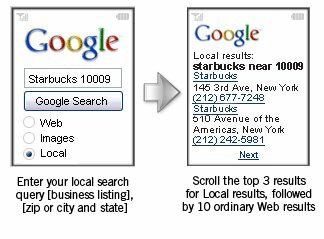 Simply type in your query and location and Google will give you instant results. In most cases you will receive a little map with a list of results. You can receive Driving Directions, Maps, Click to Call and more from Google's Local mobile service. If you prefer to use SMS to interact with Google they have an SMS search service as well. You send a message to 46645 (GOOGL on most phones) with your query, and Google sends your results back. Teh results usually get back to you within a few seconds. To see a list of all of Google's mobile services go to the Google Mobile Homepage.